On his 1968 debut album, Randy Newman began one particularly memorable song by crooning, “I’ve been his friend since we were little babies.” The music was as ingratiatingly sentimental as the vocal, but Newman quickly turned the tables on the listener. The piano shifted to rink-dinky carnival music, and the narrator was heard hawking tickets for a quarter a piece so carnival-goers can step inside a tent and see the barker’s childhood pal, Davy the Fat Boy. Despite all his protestations to the contrary, the singer was clearly no friend of the obese child placed in his care. It was also clear that the narrator was not Newman but rather an imagined character very different from the songwriter. In fact, the narrator was totally untrustworthy; he was lying about his intentions and twisting the facts to justify beliefs that were the opposite of Newman’s own. This was a way of constructing songs that hardly anyone had ever tried, and Newman did it so well and so often that it forever after became associated with him. On “Sonny Boy,” the legendary bluesman, his impostor and their audience all have their say. On “Lost Without You,” a dying woman, her children and their soon-to-be-widowed father share the stage. Instead of a musical that contains many songs, here each song contains an entire, multi-character musical. That first song is “The Great Debate,” which presents three different characters: a preacher leading a religious revival in a Durham, N.C. basketball arena, a nerdy scientist and a religious liberal. After the preacher ridicules the scientist’s vague explanation of “dark matter” (accompanied by cheesy 1950s sci-fi music), he does the same to another scientist’s defense of evolution. It’s an astonishing moment: a character rises up to defy his author like Lucifer rebelling against Yahweh. Like Edward Snowden leaking NSA files, this character exposes Newman’s secret methodology. The songwriter has long satirized the ignorant and selfish not by attacking them directly but by pretending to be them and allowing them to talk until they inadvertently expose all their worst flaws. Newman has always put words in his characters’ mouths, but this character refuses to cooperate. He felt obliged to acknowledge that some religious believers are intelligent people who also believe in climate change and evolution. In the end, though, he has to let the preacher win the debate, partially because he’s the funnier character but mostly because he has the best music. When the gospel singers (including Take 6’s Alvin Chea) start shaking their tambourines and wailing on Newman’s song-within-a-song, “I’ll Take Jesus Every Time,” all resistance is useless. At eight minutes long, with three speaking parts, a choir and seven distinct musical parts, “The Great Debate” is perhaps Newman’s most ambitious song. The album is his first collection of new songs in nine years since 2008’s Harps and Angels, but it demonstrates that the man who pioneered the untrustworthy-narrator approach to post-Beatles songwriting still does it better than anyone. If only he did it more often. It’s not as if he’s been watching cat videos for the past decade. He has composed the soundtracks for five movies: 2008’s Leatherheads, 2009’s The Princess and the Frog, 2010’s Toy Story 3, 2013’s Monsters University and 2017’s Cars 3. But the movie music comes more easily to him. When you have to write one-minute, 49 seconds of chase music for Cars 3, you pretty much know what you have to do. But inventing one of his misleading narrators from scratch is more of a challenge. “The songs come when they come,” he explains. “They just unspool. I had that line, ‘Welcome to this great arena, Durham, North Carolina, in the heart of the Research Triangle.’ I don’t know where it came from. I just played something on the piano, and it burst out of me. Whenever that happens, I go ahead and see what I can do with it. When he wasn’t writing new songs, he was revisiting old ones. 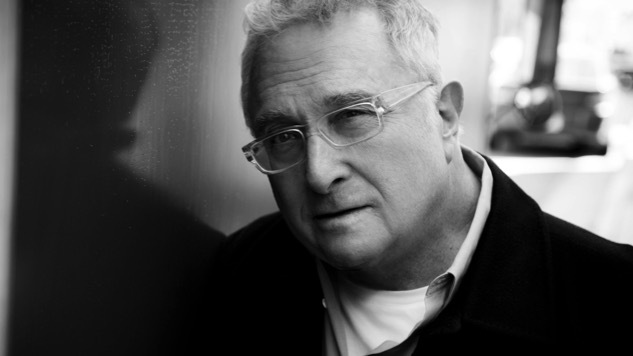 Newman recorded and released Volumes Two and Three of The Randy Newman Songbook in 2011 and 2016. These recordings of his old songs and movie themes, gathered with 2003’s Volume One into a box set last year, featured Newman alone at the piano, stripping the 55 tracks down to their basics. There was a period in the late ‘70s and ‘80s, when Newman made his albums with the L.A. musicians who played with Linda Ronstadt, Jackson Browne and the Eagles. This had the effect of trapping the songs in a certain time and place, but the Songbook versions free the songs from those constraints and reveal their timeless quality. One of the bonus tracks from Volume 3 is “Family Album: Homage to Alfred, Emil and Lionel Newman,” an instrumental tribute to his three uncles, who all composed, conducted and/or arranged soundtracks for movies and television. Alfred, the most famous, was nominated for 45 Academy Awards and won nine of them. His soundtracks for The Song of Bernadette, Captain from Castile, The Grapes of Wrath and How the West Was Won are considered classics of the genre. In a sense, Randy Newman took up the family business. He has been nominated for 20 Academy Awards and has won twice. His ability to compose and conduct an orchestra has been given many of his own recordings a cinematic scope. You can hear that on the new album. “Putin” uses the echo of “The Volga Boatman” and those 19th-century Russian composers to put us in the 2017 Kremlin. “Brothers” echoes those Nelson Riddle string charts for Frank Sinatra to put us in the 1961 White House. The strings set up “Lost Without You,” the new album’s most moving song. After the strings fade out, Newman’s voice and piano introduce the lovely theme, one of those nostalgic Southern melodies that his good friend Linda Ronstadt calls Newman’s “plantation songs.” His mother was from Louisiana, and he spent many a summer there growing up, absorbing both Stephen Foster’s balladry and Fats Domino’s second-line R&B. “‘Lost Without You’ comes from experience,” Newman confesses. “When my mother was dying, our father was taking some medicine that made him act different. My brother and I thought he was drunk or something. My mother had never expressed her love for him in front of us, but this time she did. It really opened our eyes. A lot of my aunts and uncles have died, and people are not always at their best on those occasions. I started thinking about what it would be like if my wife passed before I did. On Dark Matter Newman mixes these string arrangements and old Southern melodies with his primary musical vehicle, the New Orleans shuffle—often in the same song. Both “The Great Debate” and “Putin” switch back and forth between these musical modes. Other songs, such as “Sonny Boy” and “It’s a Jungle Out There,” sound as if they were cut during a Fats Domino session in 1955. One of the new album’s best ballads is “She Chose Me,” the bewildered response of a man to the unexpected love of a woman for such an unlikely prospect as himself. The song originally appeared in the misbegotten 1990 TV series Cop Rock. Flushed with the success of Hill Street Blues, writer-producer Steven Bochco had dreamed of a TV show that combined a police drama with a musical comedy. Last year Shout Factory released a three-DVD set of Cop Rock: The Complete Series. The shows don’t really work, and Newman contributed only the theme song as well as three numbers for the first episode—the two ballads and a hilarious courtroom number where the judge and jury turn themselves into a preacher and a gospel choir to declare “He’s Guilty.” The end of the episode, though, where a crack-addict mother sits on a public bench and sings “Sandman” as she waits to sell her baby, is heartbreaking. Cop Rock and Faust, the 1995 stage musical that he adapted from the Goethe fable with help from playwright David Mamet, take the characters that Newman has always created and puts them on the screen or the stage where we can see them. But on his best songs, you don’t need literal actors to play the roles; Newman’s music and language are enough to conjure them up in our minds. For example, it’s easy to picture Newman’s version of Vladimir Putin sitting at his vacation dacha on the Black Sea, celebrating his triumphant climb to absolute power with one vodka after another. After one too many, the hero becomes self-pitying and morose, feeling cheated that he has to settle for the Black Sea when he really wants a Mediterranean port, that he has to settle for a second-rate economy run by “chicken farmers and file clerks.” You almost feel sorry for him. When you feel that unlikely, unwanted sympathy sneaking into your heart, you know that that god-damned Randy Newman has gotten you once again.